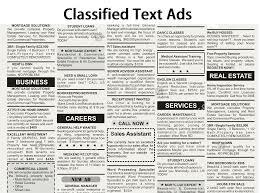 Bookclassified.com company/agency gives an opportunity to its clients/users to book best newspaper CLASSIFIED TEXT ADS through us. Bookclassified.com company/agency is best newspaper classified ad company, classified ad company, ad company, top classified ad booking company, satellite ad booking company, radio ad booking company, cinema ad booking company, digital advertisement company for all leading newspapers like TIMES OF INDIA, SAMAJA, PRAMEYA, HINDUSTAN TIMES THE NEW INDIAN EXPRESS ETC. PLEASE VISIT HOME PAGE OF BOOKCLASSIFIED.COM WEBSITE FOR STEP BY STEP BOOKING OF NEWSPAPER CLASSIFIED ADVERTISEMENTS. 1. User needs to successfully visit bookclassified.com website choose STATE, NEWSPAPER, CATEGORY AND CLASSIFIED TEXT AD OPTION. 3.Then user needs to compose ad as per required category and select publishing dates. 4. After that he should register with bookclassified website fill all the necessary details and visit online payment options mentioned in bookclassified website that is PAYUMONEY APP. 5. On successful payment your ad will be published in THE SELECTED NEWSPAPER .